MANILA, Philippines – After two intense games with lots of shoving, trash talking, pushing and even punching; the physicality on the hard court continued. Talk ‘N Text just needs one more win to clinch PBA Commissioner’s Cup Finals where Coach Yeng Guiao and the rest of Rain Or Shine gang await. The Tropang Texters beat the Hotshots 111-107 on Thursday, April 9, 2015 at the Smart Araneta Coliseum in Cubao, Quezon City. Game two hero Jayson Castro looked to replicate his hot start last game by firing 5 early points two minutes after the opening jump ball. Joe Devance on the other side of the floor, countered Castro with the same numbers at the same time and doubled his previous game low output of 3 points. Beginning quarter was too close to call and a seesaw battle unlike the first two games which only proved that both teams really wanted to win and take game three for a big advantage moving to game number four. With four minutes and a half in the first period, Mark Barroca suffered the first war casualty. Barroca and Ivan Johnson fought for the loose ball. With Johnson obviously had the reach and height advantages. He accidentally hit the 5’9” Hotshot in midair and sent him hard on the floor. Johnson was initially slapped with a flagrant foul one but reduced into just a technical after the officials learned that the hit was not intentional. Texters guards Castro, Aban and Alas were all waxing hot beyond the rainbow arc while Purefoods big men Denzel Bowles and Joe Devance both had 7 points apiece to close the first in a 33-32 tune in favor of the Hotshots. Unlike the first two games, Purefoods had a good and balance start where the locals realized that a one-sided “Monster Bowles Offense” will only do harm than good. Bowles now had his comrades’ back in terms of scoring. Castro who had 21 points during their last outing looked to surpass his series best with 18 points at the half time. But every time “The Blur” hit the basket, Denzel Bowles matched it and recorded 21 first half points. The Texters had a thin 63-60 lead after 24 minutes of quality basketball. Talk ‘N Text started the third quarter with another three point shot from former top draft pick Jay Washington. Texters had an impressive 14-22 three point field goals for 63.6% shooting with at least six players made a three point shot against Hotshots’ 2-8, 25% in the penultimate quarter. While Denzel Bowles was owning the front court in the entire third period, Ivan Johnson spent his time on the bench due to four personal fouls. But surprisingly, The Tropang Texters were still at the driver’s seat 89-80 on to the final 12 minutes of the ball game. Coach Jong Uichico continued to rest his import and opted to start the final period with all Filipino line-up which resulted into 5-0 Purefoods run plus a mandatory Texters time out. Momentum was on Purefoods’ side early in the fourth due to Johnson’s absence and had the chance to close the scoring gap within just a shot. 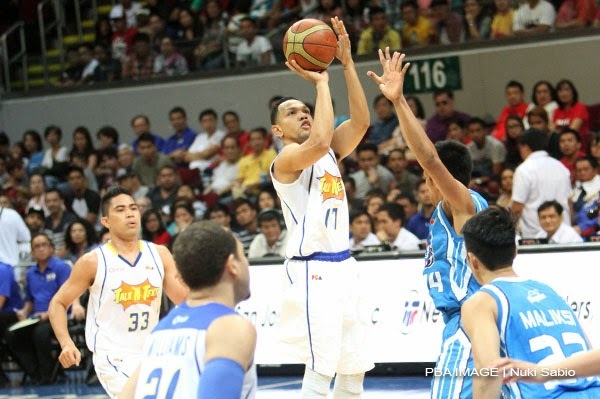 Coach Uichico finally sent his import in to cut Purefoods’ scoring drive. Upon Johnson’s return, three pointers rained heavily from Jason Castro, Ranidel De Ocampo and Ivan Johnson himself. Both Castro and Johnson exceeded their last game performance with 27 and 26 points respectively as the Talk ‘N Text Tropang Texters now have the 2-1 best-of-five advantage. For the second time in the series, Jayson Castro won the Best Player of the Game Award.